To Cite: Mousavi S A, Mousavi S J. The Effect of Ambient Temperature Changes on Micturition in Infants ‒ A Study of 800 Infants Aged up to 12 Months, J Compr Ped. 2015 ; 6(2):e26744. doi: 10.17795/compreped-26744. Background: Cold may aggravate urge symptoms in patients with frequency/urgency syndromes. Objectives: This paper attempts to establish the correlation between the changes in three variables, namely the changes of ambient temperature, age and weight of conscious infants and their micturition rate. Materials and Methods: The time interval between the napkin removal and micturition was recorded, in order to establish the relationship between environmental temperature changes and urination. Results: Micturition occurred in response to decreased skin temperature of the lower trunk, during the first minute interval of napkin removal, in 287 of the infants (35.9%). 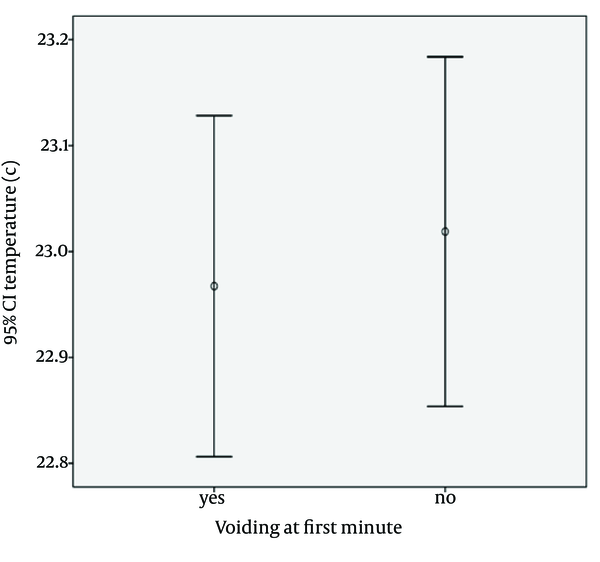 Totally, 428 infants (53.5%) voided in a 5 minute interval. The younger infants urinated more frequently and also faster, in relation to ambient temperature changes. Conclusions: We concluded that the occurrence of urination, as a response to cooling stimulation of the lower trunk, is correlated with infants’ age and amount of environmental temperature degree. Virtually every mother has experienced the moment when, changing the baby's diaper, the child attempts to urinate. Bors and Blinn noted that the instillation of small volumes of ice-cold water into the bladder brought about involuntary detrusor muscle contractions and micturition in patients with spinal cord lesions. The study also demonstrated that the same volume of body temperature water was ineffective in inducing the same result as the ice-cold water did (1). Furthermore, studies conducted by Goodman et al. demonstrated that conducting cystourethrogram in infants, under one year of age, using contrast media, with a temperature equal to body, was less stressful compared to applying contrasts of ambient temperature. Moreover, both body temperature and cold saline flow in the urethra induced bladder contraction (2). It is assumed that ice water stimulates cold sensitive C fibers (3). Studies conducted by Sato et al. demonstrated that mechanical or thermal stimulation of various skin regions brought about reflex changes in the urinary bladder of anesthetized cats. When the bladder was dormant, mechanical/thermal stimulation of the perineal skin produced an increased bladder tonus. The cutaneo-vesical excitatory reflex was a spinal reflex, with its efferent arc located in the pelvic nerves (4). Most studies described above have been experimented in animals and with review of English language literature. However, no study with a large infant population was found. The aim of the present study is to evaluate the effect of environmental temperature on urination and assess the cutaneo-vesical excitatory reflex in infants under 1 year old, in a common situation and under different room temperature circumstances. This study was conducted on 800 infants, who were brought by their parents for circumcision in an outpatient office, between September 2012 and August 2013. All participants were full-term healthy male patients, without any medical indication or urological anomaly and were all operated on by a single pediatric surgeon. All infants were fed until 15 minutes before operation. The temperature of office room and waiting theater were equal throughout the year. Immediately after removing of diaper, the time monitoring began. The infant was placed on a circumcision restraint board. In this situation, they remained quiet and showed no sign of discomfort. After a minute, a dorsal nerve block was emplaced using 0.2 mL/kg of 2% lidocaine with a 27-gauge needle. Four minutes were allowed to elapse for all infants before starting the circumcision procedure. Eventually the circumcision was performed with a Plastibell technique. If the baby had urinated during this period, the exact time of micturition was recorded. Data were analyzed by SPSS 16 software (SPSS Inc., Chicago, IL, USA). Differences were tested using unpaired Student’s t-test, proceeded by the evaluation of normality and were checked for homogeneity with the use of Levene’s test. Results were considered statistically significant if P < 0.05. A total of 800 healthy children were included in this study (mean age 2.3 months, ranges 0.1 - 12 months, SD = 2.06). Their body weights ranged from 2.3 to 11 kg (mean = 5.2, SD = 1.52). Environmental temperature ranged between 19 and 26°C (mean = 23, SD = 1.65). Micturition occurred in response to decreased skin temperature of the lower trunk, during the first minute interval of napkin removal, in 287 of the infants (35.9%). The error bar charts in Figures 1 and 2 show the responses of the bladder when the infants are exposed to temperatures lower than 37°C, for different time durations. In the first minute after exposure to room temperature, there was a significant positive correlation with micturition (P < 0.001). The younger infants respond more and faster to ambient temperature changes. Correlations between the micturition with the age, weight of children and ambient temperature have been demonstrated in Figures 1 and 2 , Table 1. 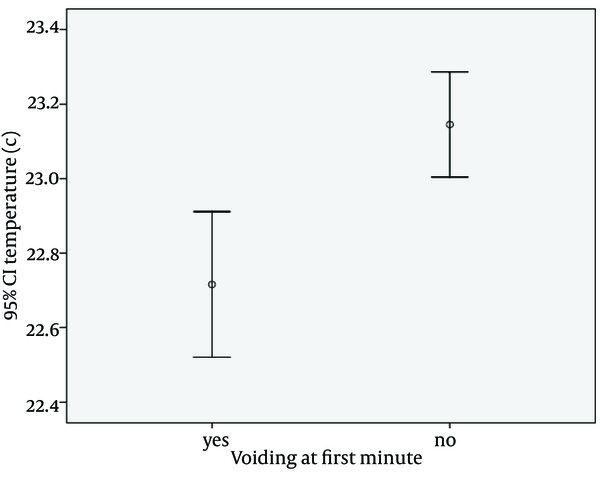 The voiding immediately after opening of diaper is a common question for parents. Is there any relationship between age and weight of infant and reflexive micturition? What is the role of ambient temperature? For diagnosis of voiding problems it is necessary to know this pathway and answer these questions. The reflexive emptying function of the bladder, without central nervous system involvement, demonstrates certain bladder instability, which can be present in normal infants and toddlers. The infantile causes of bladder instability do not disappear with growth and development; alongside lies the development of inhibitory systems of the nervous system in order to overcome such urinary instabilities (5). The traditional assumption held amongst clinicians is the minimum or lack of neural control on micturition in newborns and young infants. It was even believed that micturition in newborns occurred via spinal cord reflex in a full bladder. Recent studies have indicated that even in mature fetuses and newborns, micturition is modulated by centers situated higher in the central nervous system (6). Contemporary studies have demonstrated that the fetus voids at the rate of approximately 30 times every 24 hours during the third trimester of pregnancy; however, this rate declines when the pregnancy approaches its term. Such decreasing voiding frequency during the first few years of life are considered to be caused by increasing bladder capacity proportional to body growth (5), i.e. the larger the body, the larger the bladder capacity. The inhibitory and excitatory areas in the pons, suprapontine and the cerebrum play important roles in the regulation of micturition reflexes (7-9). Two specific types of bladder afferent nerves are associated with bladder activity in the pelvic nervous system - myelinated and unmyelinated (C fibers). The myelinated fibers respond to bladder distention, whereas the C fibers respond to cold. During normal micturition, however, both of these fibers are inactive. However, during certain pathologic states or prematurity, these “silent” C fibers appear to activate (7, 10). Studies conducted by Sato et al. suggest that large contractions of the bladder, in animal subjects, could be inhibited by nociceptive stimulation. On the other hand, our study demonstrated that the peak of the response was reached within the first minute after the beginning of stimulation. Although our report cannot be compared with their animal study, we have found that, in the first minute after exposure to room temperature, there was a significant positive correlation between the age and weight of subjects and the rate of micturition. It seems that this is related more to the prematurity of the nervous system in neonates than infants. On the other hand, the bladder cooling reflex is suppressed in older infants. This states control of the bladder contraction by upper motor neuron system. Although we had an additional stimulation with a solution around genitalia and perineum, at second minute, and a relatively painful stimulation by needle of lidocaine injection, at the third minute, the majority of subjects urinated during the first minute. However, we do not know if lidocaine may be a confounding factor in our study and suggest further studies in awake infants, with and without local anesthesia. In conclusion to our study, the response of the bladder to cooling stimulation of the external genitalia and suprapubic skin is correlated to the age of infants and environmental temperature. The authors would like to thank Abbas Aramideh for his cooperation in writing this text. Authors’ Contributions: Seyed Abdollah Mousavi performed data collection and paper writing. Seyed Jaber Mousavi developed the design and analysis of data.